Bermuda's first Dry Stack Boat Storage System! The racks offer safe and dry storage to keep your boat year round. Bermuda's First Dry Stack Marina System. The design is based on a time proven system used throughout Florida and the Great Lakes for over 20 years. The racks offer safe, dry, clean, permanent storage to keep your boat year round. Boats are picked up and moved to and from the water by a 24,000 lb purpose made Wiggins forklift truck. Onsite ServicesUnlimited Boat Launching and Hauling • No Trailering Hassles • No Mooring Maintenance • Less Boat Maintenance • Easy Access to Work on Your Boat • Safety During Hurricane • 7 Day per week Access. 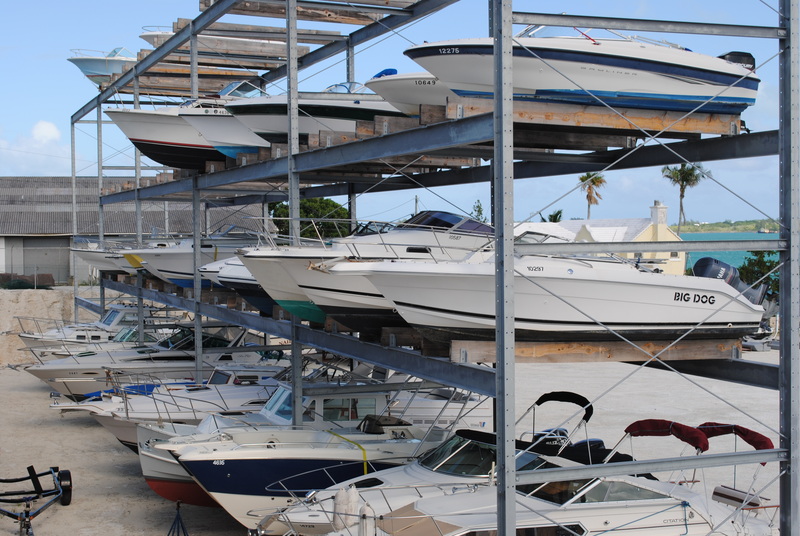 Boat StorageCome and view our facility through our photo gallery of Bermuda's First Dry Stack Boat System. With 90 Dry Stack Berths, 20 Single Rack Berths. Reasonable Rates With No hidden charges pay just $20.00 per foot, per month. We provide Unlimited, on demand, launching and hauling service. Our Rates for Hurricane Haul Out and Storage are just $15.00 per foot; which includes 3 days of storage.